The Homeschool Gossip: Old Salem Homeschool Days! Special hands-on activities from 10 a.m. to 3:30 p.m.
Join us for our annual Homeschool Days for home-educated families! You will be able to tour the historic district and learn what life was like in the Moravian congregation town of Salem. 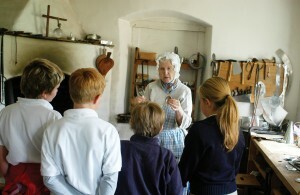 The day is interactive for the whole family with hands-on activities, demonstrations and costumed interpretation. Visit the newly renovated Doctor’s House and learn about Dr. Vierling and his family, 18th and 19th century medical practices and see our new interactive exhibits. Learn how flax was processed and how it turns into linen. Visit the St. Philip’s African-American complex and learn how to create a Kente weaving. Try your hand at playing the game of nine pins! Visit the Miksch House and garden and see what they are doing today! Make a blank book to take home. Make a botanical watercolor, like students would long ago. See the craftsmen at work in the Single Brothers’ House. Home educated families will receive our group tour rate of $11 per child (ages 4 through 18) and $23 per adult. Children under 4 are free. PLACES TO STAY, if you know of others, comment below!